The discovery of the self is the most valuable lesson we can ever learn, but it’s not something we get taught at school or can get from a book. When we journey inwards to discover who we really are, we will have a better understanding of our values, our natural talents and abilities. This is turn can help improve relationships, find the right career, become mentally and emotionally healthier and stronger and just generally feel more like you’re living ‘in flow’ instead of against it. For me this beautiful and sometimes scary and arduous inward journey, helped me to learn more about my capabilities, passions, what excites and inspires me and what I truly love. All areas of which I was greatly lacking in and had very little insight about, as my focus was very much on the external world and maintaining relationships according to what I felt others wanted or expected of me. I’ve recognised that we are entering an awakening phase. This phase stepped up a notch in 2012 and continues to have a ripple effect on us all. I believe we are all awakening to what is possible - not probable. That our perceptions are being challenged in order to see the bigger picture. To find order in the chaos, recognise the truth within the lies and let in love, not fear. I work with women both in groups and on a 1:1 basis to help them - Awaken - Create - Shine. A 3-step guide to aligning with your soul. Each stage and transition brings with it specific lessons and helps to harness your natural gifts, for example intuition, whilst challenging old beliefs and behaviours that might be holding you back. 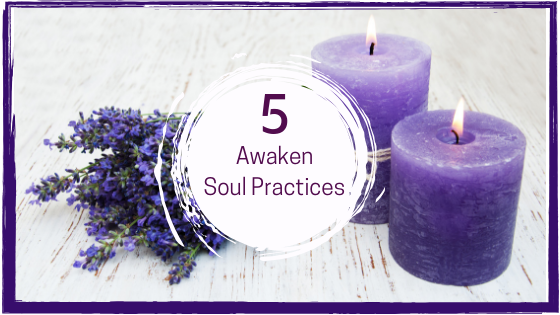 I’ve produced over 20 Awaken Soul Practices to help guide you through your soul’s awakening. This blog will highlight 5 of them that you can start to use right now. I’ve been through what I believe to be a spiritual awakening and experienced all of the highs and lows this process can bring. Everything that I’ve learned - that has been presented to me as soul or life lesson - I now share with my fabulous clients to help, guide and support them through coaching, soul practices and soul healing. Every day in every way, try your best, share your gifts, thoughts and ideas with others. This practice asks you to be completely honest with yourself and ask, how many times do you compromise, shrink away from the spot light, silence your own voice and opinion? Tell yourself you’re not good enough or worthy enough for others to listen, notice you or feel inspired by you? A very big lesson for me was learning that whilst it’s safe to sit by the sidelines and watch every one else taking a risk and baring their soul, I wasn’t being authentic by doing so. I wasn’t being true. Hiding was a comfort but not one that would help me be the best version of me that I could be. I had something to contribute and I wasn’t helping anyone by not doing so. Are you existing or are you living? You’re here and that’s a blessing. Get grounded and connect to your ‘HERE I AM’. This practice asks you to stop and take a minute to connect to the present moment. Look at your daily life - what is it mostly comprised of? Are you finding yourself on autopilot, just trying to get through the day? Are you just getting by, or maybe you’re living in the future or find yourself stuck in the past. I had days, weeks, even months when I wasn’t really here at all. I’d be daydreaming of a better life, ruminating over past events and generally felt disconnected to everything around me. Tell yourself very firmly right now, that you’re here and that’s a huge blessing. You are here. This helps you to be in sync with what feels right. It’s safe to trust your intuition - it comes from a place of truth. How many times have you had a feeling about something but dismissed it because your thoughts were telling you something else entirely? Ideally we want our thoughts and feelings to work together and be in alignment with each other, but that takes practice. Especially if you’re used to prioritising your thinking and rationale over anything else. Albert Einstein once said “the intuitive mind is a sacred gift and the rational mind is a faithful servant. We have created a society that honours the servant and has forgotten the gift.” It’s time to remember yours! Allow yourself to make choices from a place of love. Don’t let fear limit what you choose. I remember reading somewhere that only love is real. I had a real difficulty in accepting this. What about all of our other emotions and feelings? Are they false? Are we wrong to feel them because they’re not real? Then I realised that the message was more about understanding fear. We have real, genuine fear and we have what I call ‘man-made’ fear. The latter is what feeds our anxiety and pushes our stress levels up to the extreme, if we’re exposed to it over a set period of time. So really the message for me was about choice. It was about choosing love over fear. Or rather, not allowing my fears to determine my choices. This practice then, simply asks you to be in alignment with love when you’re faced with a decision. You are the author, everything written so far has given you the knowledge you need for your next chapter. It’s a difficult thing to take ownership and responsibility for the things that you wish never happened or that you feel sad about. If you don’t feel like you have control over the pen, how can you be responsible for what it writes? Here’s the thing though, if you give someone else or any situation power over you, they can influence you to write whatever they like and mould the story to suit their needs, not yours. So today, accept that and forgive yourself and anyone else that has resulted in you writing a hurtful, sad, angry or unjustified chapter. It wasn’t a weakness in you, it was the perfect way to learn what you needed to, so that you can take ownership of your pen. Start to write the story you want to live. Be brave and make mistakes that you choose to make, not ones that others push you towards. You’re only human. It’s okay to get things wrong. It’s time to own your story. I hope you’ve found this blog helpful - if you’d like to sign up for the soon to be launched online course to Awaken - Create - Shine then go to the Soul Practices Page. If you’d like to take my fun, creative and insightful soul type quiz to find out what stage you need support in now - you can do this here: Soul Type Quiz.